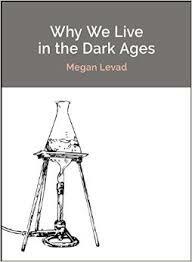 Megan Levad’s debut book Why We Live in the Dark Ages is Tavern Books’ first annual Wrolstad Contemporary Poetry Series Selection. Why We Live in the Dark Ages considers how information about science and history is transmitted through language, rather than empirical experience—and how successful that transmission often is, despite its flaws. Levad holds her poems up to us as a mirror, showing the absurdity, helplessness and humor of the human condition. These poems are not meta or worried about where they might fit into the canon. Levad doesn’t employ the usual poetic arsenal, although at its heart this book wonders and ruminates over the magic of language—not how we craft our stories for the page, but how we actually tell them. Megan Levad’s poems have appeared in journals such as Denver Quarterly, Fence, Mantis, and Tin House, and in the Everyman’s Library anthology Killer Verse. She also writes lyrics for composers Tucker Fuller and Kristin Kuster. A native of rural Iowa, Levad lives in Ann Arbor, where she is the Assistant Director of the Helen Zell Writers’ Program at the University of Michigan. The Wrolstad Contemporary Poetry Series exists to champion ex¬ceptional works of poetry by young female poets through a book publication in The Living Library, the Tavern Books catalog of innovative poets ranging from first-time authors and neglected masters to Pulitzer Prize winners and Nobel Laureates. The Series is open to any woman 40 years of age or younger who is a US citizen, regardless of publication history, and was inaugurated in 2013 to honor the life and work of Tavern Books author Greta Wrolstad (1981-2005), author of Night is Simply a Shadow (2013) and Notes on Sea & Shore (2010). The open reading period runs annually from October 1st through January 15th. Megan Levad will also be giving a craft talk at Literary Arts on Saturday, September 12 at 2:00 p.m. Megan’s appearance at Literary Arts is partially funded by Regional Arts & Culture Council grant.